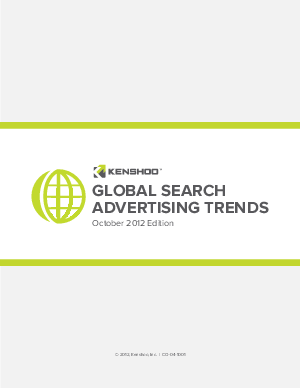 Kenshoo Global Search Advertising Trends is the first in a new series of reports reflecting aggregate campaign data across search engines like Google, Yahoo!, Bing, Baidu, and Yahoo! Japan. More than $3 billion in annual paid search budgets are managed through Kenshoo by the most sophisticated advertisers and agencies in the world. Kenshoo clients include 4 of the top 5 U.S. travel websites, 6of the top 10 global hotel chains, 7 of the top 10 global retailers, 8 of the top 10 global telecoms, 10 of the top 10 global ad agency networks and 24 of the Fortune 50 companies.